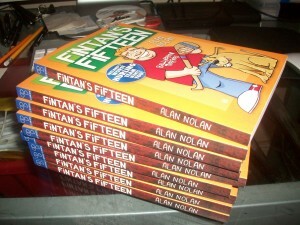 Author Alan Nolan talks about how he wrote and illustrated Fintan’s Fifteen, the first illustrated novel about hurling. A couple of years ago I pitched some book ideas to O’Brien Press head honcho Michael O’Brien and their in-house graphic designer Emma Byrne. They were mostly ideas for detective or murder mystery books for younger readers, and these became the ‘Murder Can Be Fatal’ series and The Big Break Detectives Casebook. I was always interested in detective novels – Sherlock Holmes, the works of Agatha Christie, the Agaton Sax books by Nils-Olof Franzén and the incomparable Tintin series by Hergé were some of my favourites – and I had a background in comic strip illustration from writing and drawing my own self published comic book, Sancho, so the most natural way to approach these books was as graphic novels. At that meeting I also pitched an idea for a sports book – it was to be the story of an U12s hurling team, the Ballybreen Terriers, who were on their uppers, languishing at the bottom of the league, with half their players walking out. The idea would be that they would convince an inspiring child bainisteoir to come out of self-imposed retirement and back to hurling. This new manager would recruit players from different sports, each of which would bring their own particular skills to the hurling team, and this would bring a sense of fun back into the team and allow them to slowly climb back up the league. Being such a fan of detective books, I also had to get a bit of intrigue into the story involving some long-lost priceless emeralds and a stolen trophy! 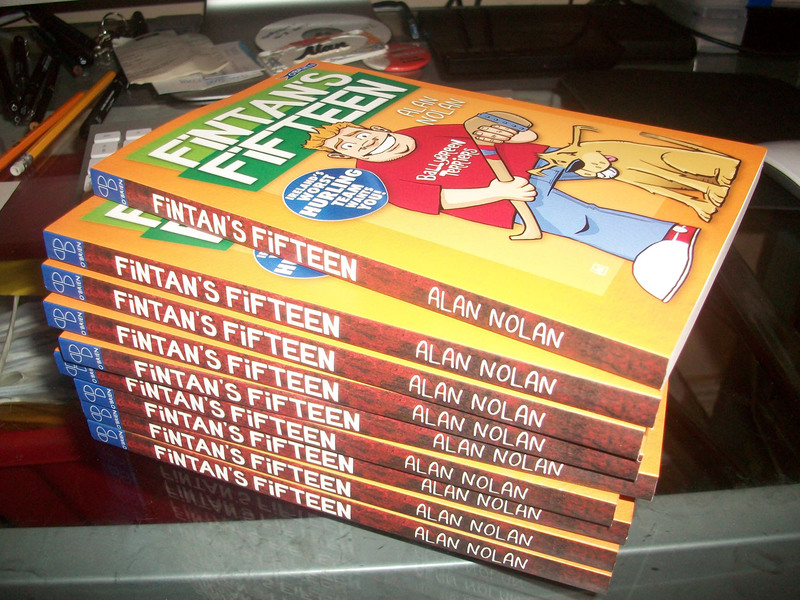 This book became Fintan’s Fifteen. 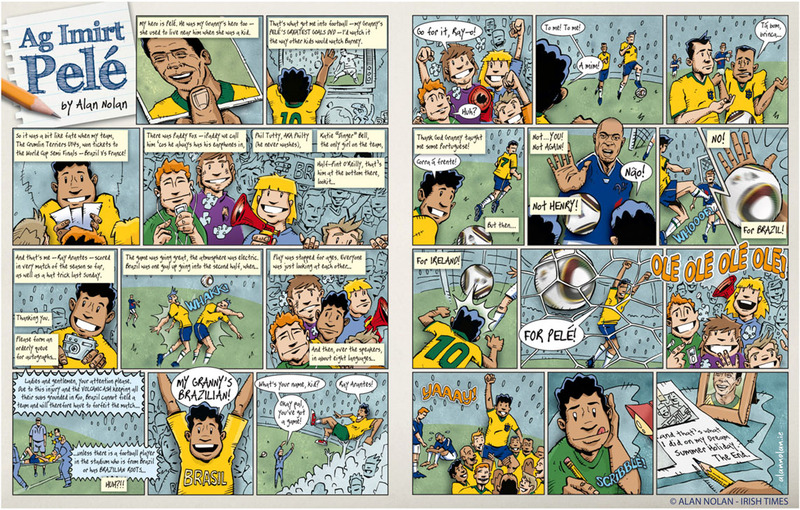 I had previously done a two page cartoon strip for the Irish Times soccer World Cup supplement, featuring a young Brazilian-Irish boy who goes to the World Cup and ends up playing for Brazil. This character’s name was Ray ‘Rusty’ Arantes and I thought he would make a fantastic narrator for the book – he was a great soccer player, there was no reason he wouldn’t be a great hurler too. 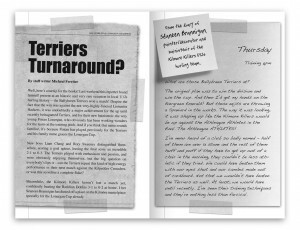 The other main characters were the titular Fintan, a couch potato ex-hurler, washed up at 12 years of age, who discovers his mission in life is to resurrect the good name of the Ballybreen Terriers and to turn their fortunes around, and Katie ‘Dinger’ Bell, the Terrier’s number one fan and an accomplished majorette who becomes Fintan’s right-hand girl. 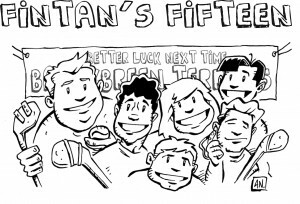 The remaining characters who make up the Fifteen include golfing prodigy Rory Sweeney, acrobat Liam Chang and Dominic ‘Mansize’ McLean, a wresteler and Scottish Highland Games enthusiast. 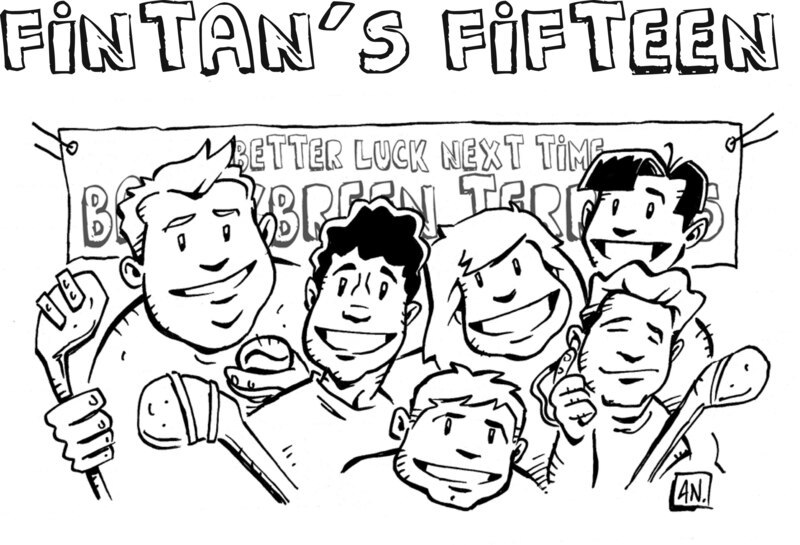 But my favourite character is Ollie the dog, the team mascot and the original Ballybreen Terrier. Ollie has the role of assistant narrator, giving a dog’s view of the action, and bringing the narration into places that Rusty physically can’t go! As well as that, we can have fun with him as he chases cats, sniffs other dogs’ bottoms, and generally behaves like… well, like a dog! 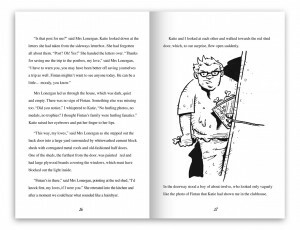 I started the book with a back-of-the-book type blurb and some character sketches, which I pitched at the initial meeting. (Both this brief synopsis and the sketches would change considerably in the writing!) Michael liked the idea, so I developed the blurb into a storyline which I submitted a couple of weeks later. Once I got the go-ahead on this, I started to try to figure out how I would go about writing the book. I decided that Rusty would be a great narrator, as he would give a straightforward and honest account of what was going on, almost like he was keeping a diary. 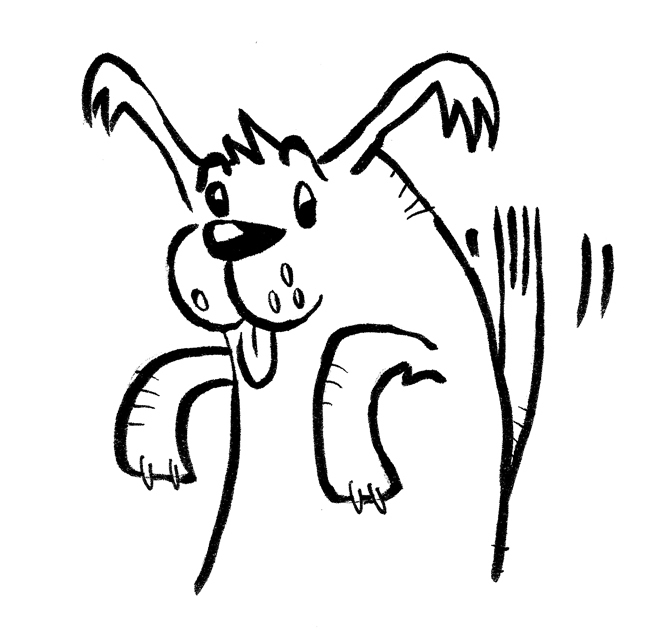 Then, to add some fun to it, I came up with the character of Ollie the dog, named, incidentally, for my brother’s dog who had sadly passed away. Ollie would tell his side of the story in a witty, somewhat world-weary voice, and best of all, he would tell it in a cartoon strip – I knew I wanted to have plenty of illustrations in the book, but I also wanted to have cartoon strips, and it was the character of Ollie gave me the perfect opportunity to do that! While Rusty and the team were concentrating on having fun and trying to win the cup, super-canine-sleuth Ollie would be unraveling rival bainisteoir Séaneen Brannigan’s plans to steal the same trophy. 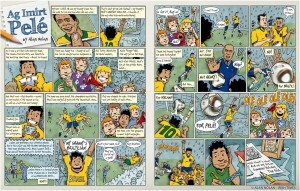 The cartoon strips were great fun to do – I simplified my usual style to make it look like Ollie had drawn them himself! 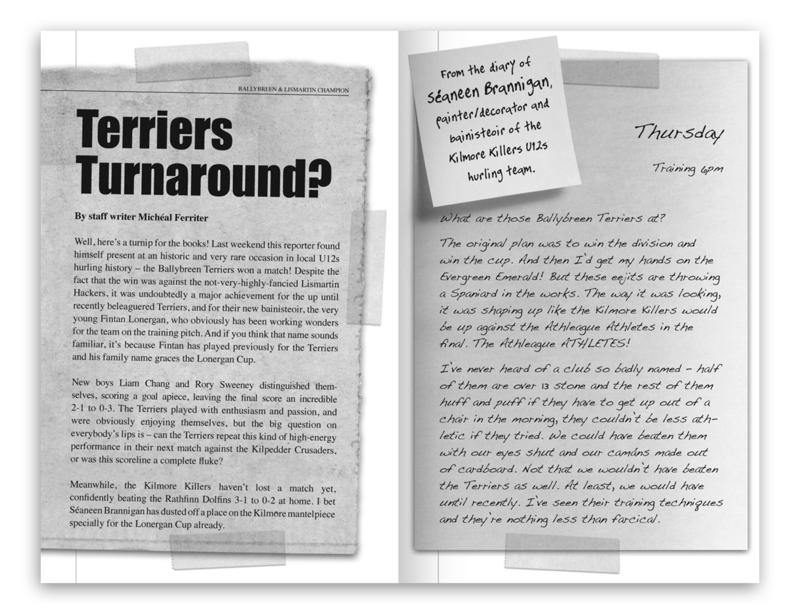 As well as all that I decided to add pages from Séaneen’s diary outlining his evil plans, and cut-out sports reports detailing the Terrier’s amazing comeback. I used photographs of actual torn out pieces of paper for these parts, using a handwriting script to simulate Séaneen’s diary pages, and replicating newspaper layouts for the news reports. When I had the book written and the illustrations and cartoon strips penciled out, I sent them to my editor Mary Webb. While she was going through it with a fine-tooth comb, I started inking the illustrations, and by the time I was finished, so was she! The book was approved and went off to print early this year. A couple of weeks ago, I got my advance copy in the post. 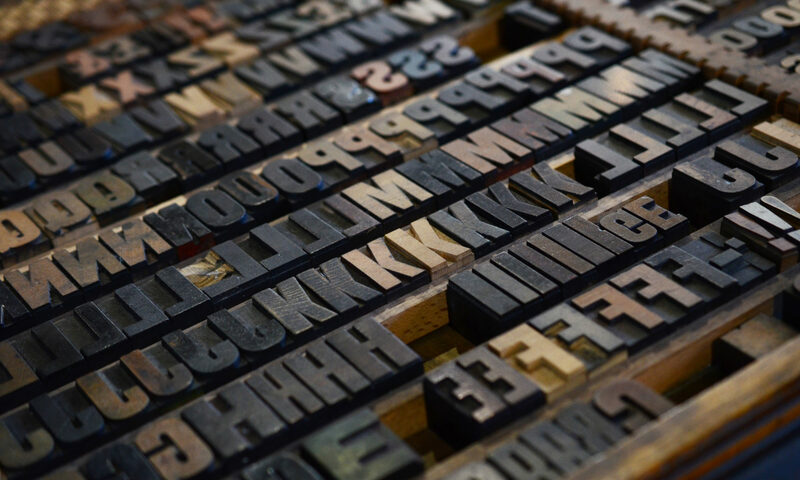 This is a worrying time for an author, as if we spot any mistakes, it’s too late to change them! Happily, the book was exactly as it should be and I am delighted with it. Now I can’t wait for you to read it too! 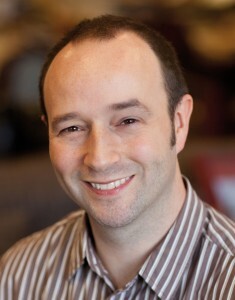 Alan Nolan is a comics writer, graphic designer, artist and co-creator of the horror series Sancho. 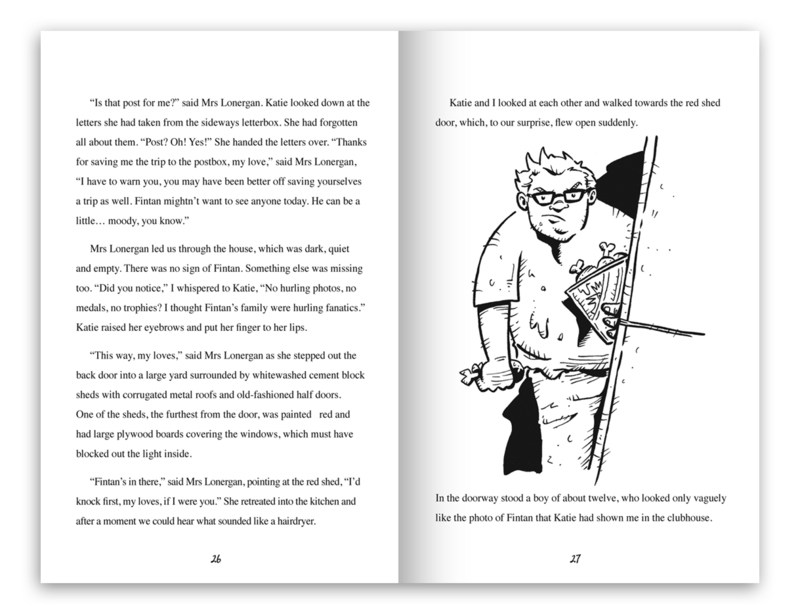 He is the creator of The Big Break Detectives Casebook, a graphic novel for younger readers, and the ‘Murder Can Be Fatal’ mysteries. Born in Dublin, he studied at the National College of Art and Design. He lives in Bray, County Wicklow, with his wife and three sons. Celtic Warrior came about from my lifelong ambition to tell a story within the world of Irish mythology. I still have scraps of paper from when I was a child with detailed descriptions of the Cú Chulainn video games and animated series that I would dream up! I’ve been lucky enough to have worked for the top comic properties in the world with Marvel and Star Wars. As much as I love working in a universe with Spider-Man and the Avengers, nothing will come close to the sentimental ties that I have with Celtic Warrior. It was great to have a launch in my home city of Cork which my family and friends could attend and I was overwhelmed by the turnout of comic and Irish mythology fans that came along. I broke into the comic book world over a number of years by following a simple rule of drawing every day for five hours. Posting my work on the internet enabled me to share my work with anyone and so far I have got the chance to work on properties such as Star Wars, Farscape, MacGyver and Fearless Defenders amongst others. 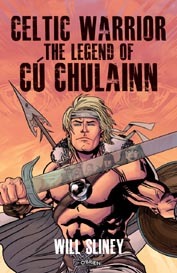 I’m hoping that Celtic Warrior: The Legend of Cu Chulainn will inspire the next generation to pick up their pencils and draw out the scenes from their own favourite Irish mythological stories, or even to create their own! 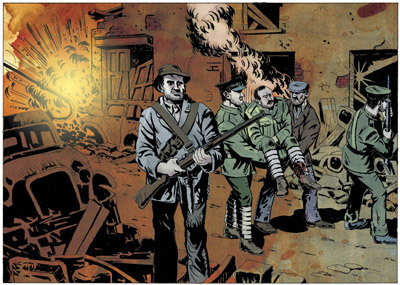 Celtic Warrior is the first Irish published graphic novel to hit the Top 10 bestseller list in Ireland, reaching No. 8 in the Original Fiction Irish Bestseller list in its first week of publication! For all the up to date news on Celtic Warrior check out Will’s blog.